I know it's only February. But this year, these are going to be hard to top. Congrats, Xenoblade Chronicles X, for some of the dumbest-looking characters of 2015! Before we start, realize I don't think characters with stupid faces are problematic. Not in the least! Rather, I'm charmed by their unapologetic ugliness (no need to appeal to me, you hideous beings!). But, elsewhere online—forum NeoGAF, Reddit, Twitter and website GeekParty—people have been quick to note that the game's characters sure look bad. "This game has the worst faces I've ever seen in a modern title," wrote NeoGAF member The Shogun. "They look awful." That is true. They really, really, really do. Look, you can't win 'em all. There is an argument that the characters' faces look awful because they're influenced by Japanese animation, which is shorthand for they have giant eyes. Anyone who watches anime will be quick to point out that not all anime character have huge peepers. Though, in anime, they seem to have reached critical mass. Moreover, loads of video game characters are anime-influenced (shorthand for they have big eyes), and they're not nearly as repulsive. Like this guy. Plus, Japan doesn't have the market cornered on disproportionately large eyes. (I'm looking at you, Disney!) And giant-eyed American cartoon characters like Betty Boop influenced the look of 20th century Japanese animation. So, why exactly are people saying these Xenoblade characters look dumb and bad? Over on GeekParty, writer Mandi Odoerfer points out that not only are the eyes and mouths too big for the characters' faces, but that they all look somewhat cross-eyed. And not all the characters look so stupid. This guy is pretty cool. "Their features are proportional to their face, and they don't look like they met the wrong side of the warp tool," Odoerfer adds. "Most of these characters also have facial hair, which might play a role in their not-awful appearance." Redditor Mykath also has an explanation as to why the Xenoblade Chronicles X characters cause such a knee jerk reaction: "The realistic shadows don't complement the 'doughy' faces and instead has a weird uncanny valley thing going on a bit." NeoGAF user ZeroMaverick, however, thinks that the foreheads are oversized. Perhaps it's the combination of these? The problem is that Monolith Software, as talented as the studio is at making engaging RPGs and building video game worlds, isn't that great at making character models. That's not necessarily a bad thing. I'd say it's part of Monolith's charm—and it's something the studio has been doing for years now. Some of the in-game characters, yes, look dumb. But there's an avatar character for your character to help you mitigate (or at least control) the stupid-looking character quotient. Or you can always make your character look even uglier. Come on, embrace visual stupidity. Do it. 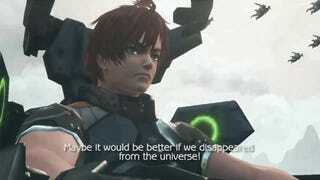 If you are playing Xenoblade Chronicles X for handsome digital beings, then perhaps you'd like to look elsewhere. (Have you heard of Final Fantasy?) 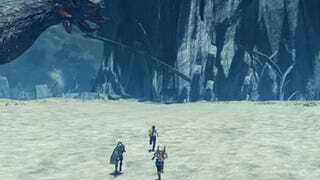 If you're keen to play Xenoblade Chronicles X to run around a giant world, control cool mecha and badass monsters, then you've come to the right place, however ugly its inhabitants are.